Burj Khalifa - the tallest building on earth . Its said, to get on top of the world you have to get on top of burj khalifa . It was previously known as Burj Dubai before the official inaguration. This skyscraper is part of the flagship development called Downtown Dubai at the 'First Interchange' along Sheikh Zayed Road, near Dubai's main business district . The building is a mix of offices , housing apartments , hotels , suites , restaurants , residential flats . On the 124 th floor is an observatory named At the Top observatory . A very unique view of dubai is possible from this deck and you can click great panoramic photos and pictures of dubai from here . The entrance fee / tickets cost AED 100 - 400 . More than 1,000 pieces of art adorn the interior of Burj Khalifa. The luxury inside the lobbys are amazing. On 28 March 2011 , Alain Robert climbed to top of Burj Khalifa in 6 hours . The total cost for the project was about US$1.5 billion . The project completion happened during the global financial crisis of 2007–2010 . The name Burj Dubai was changed to Burj Khalifa in honour of the UAE President Khalifa bin Zayed Al Nahyan for his crutial supports to Dubai . 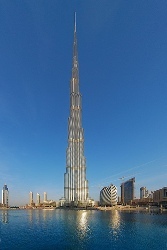 Burj Khalifa (Burj Dubai) grabbed its guinness book of world records from the previous record holder Taipei 101 . The primary contractor was Samsung C&T of South Korea . Tom Cruise has performed stunts while dangling on the side of Dubai's Burj Khalifa skyscraper for the movie Mission Impossible : Ghost Protocol - the action-packed fourth film in the superspy series . The video footages of this scene has been out for sometime now . Dubai is waiting for the movie to hit the cinema theatre . Armani hotel in the tower is one of the premium hotels here . There are many tour programs to the tower . Some tourists wrongly spell it as burg khaleefa. The atmosphere around this part of Dubai is a very different one from its traditional on. To find out what are other interesting facts about the skyscraper there are new blog posts coming up .